Xilisoft iPhone Software Suite is a jam-packed multimedia suite for your iPhone! 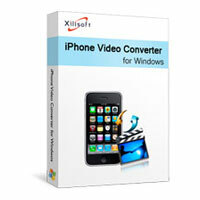 This pack contains: DVD to iPhone Converter, iPhone Video Converter, iPhone Ringtone Maker and iPhone Transfer. DVD to iPhone Converter and iPhone Video Converter will convert Home DVD movies and any video files to iPhone (MP4) videos or convert audio files into MP3, M4A or WAV formats. iPhone Ringtone Maker allows you to create ringtones out of your favorite music or even video files, and iPhone Transfer helps you transfer and backup iPhone files to your computer and vice versa, and transfer iPhone files to iTunes. With this iPhone applications suite, you can now convert home DVDs to play with your iPhone, create iPhone ringtones and transfer files between iPhone and computer. It’s the ultimate multimedia pack for your iPhone!